Stay up to date on Store Promotions and Events. Fill out the form below to receive exclusive details from the Rockler Houston store. 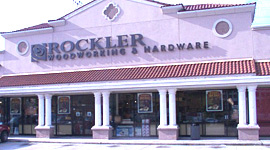 *Be assured that Rockler does not sell its e-mail lists to anyone, so your information is safe with us. Learn how to easily install new drawer slides and european hinges using a couple specialty Rockler jigs. See how simple it is to make a one-of-a-kind turned wooden pen. Stop in to learn about the MicroJig GRR-RIPPER, a must have product for any table saw user. Watch us show you how easy it is to apply a professional quality finish using the Rockler Finishing Sprayer. See how fast and easy it is to build custom dovetailed boxes using the Rockler Dovetail Jig. Learn woodturning basics while we show you how to make your own custom handles for garden tools! Learn how to resaw lumber like a pro using the 14" Rikon Bandsaw & Bow Products Guide Pro Featherboard. Watch how fast and simple it is to build mitered boxes using the Rockler Miterfold Dado Set. Why not come and "Take a walk through our woods". We feature premium domestic and exotic lumber as well as hard-to-find veneers. Would you like to turn your hobby into a career? Please see our Career Center for position details and how you can join our fun loving team!